In just 18 months the Integral Coach Factory (ICF) in Chennai has rolled out the country’s fastest train. The engine-less ‘Train 18’ has even crossed the speed of 180 kmph in a trial run. 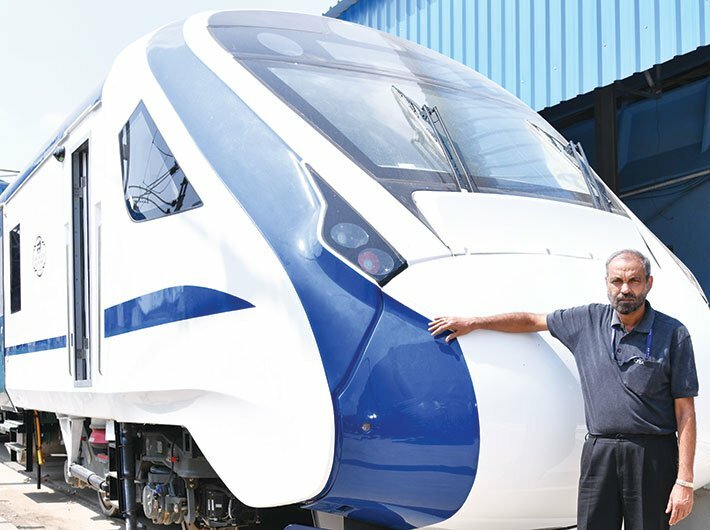 ICF GM Sudhanshu Mani talks about the factory’s future plans where it plans to not only manufacture more trains like Train 18 but also manufacture sleeper class train sets fit for running at 160 kmph. After rolling out India’s first train set prototype, what are the ICF’s future plans? What makes Train 18 different? There has been a lot of media attention on Train 18 since we first shared the concept. After its unveiling and subsequent 180 kmph speed trial run, it got extensive coverage in India and abroad. The ministry of railways has sanctioned six sets and it wants us to make those. We have said yes to the proposal and now await a final count from the ministry. Another fact perhaps not known yet is that we have enquiries from abroad about Train 18. Although the train has been designed specifically for India, after some proliferation here, ICF would certainly be ready for export. Something which we did no declare before the test was our efforts to make the train free of jerks and improve its ride quality. The tests so far seem to show that we have certainly succeeded. Train 18 is hailed as a Make in India product, with 80 percent of equipment designed and manufactured by Indian firms. What kind of components were imported for Train 18? About 20 percent of the cost went towards imported equipment such as braking systems, seating, plug doors and a few other components that were not available in the Indian market. ICF is now taking all steps to develop in-country resources for such items and with successive rakes the indigenous component will continue to increase. When can we expect a fully made-in-India Train 18? It is already a very good example of Make in India as it is conceptualised, designed, engineered and built in India. We should be 100 percent indigenous in about 30 months. We were the first to make fully indigenous LHB coaches. Can you elaborate on the challenges faced by the ICF in manufacturing Train 18? It’s actually just 18 months as we received the go ahead from the Railway Board in April 2017. The challenges involved intelligent processing in all fields like interaction with consultants for conceptual design, detailed design, development and prototype tests of sub-assemblies and subsequent supply chain, assembly and manufacture of the shells followed by furnishing and intricate testing and commissioning. Such a project has never been attempted by Indian Railways before, let alone the ICF. Our mode has been to acquire technology for rolling stock and assimilate it gradually with the help of the partner. This was a whole new ball game; we were the developer of the technology and had to be in the lead all the time with our own technical teams as well as the vendors who were developing the sub-assemblies. Coming to specifics, it’s noteworthy that Indian Railways did not have ready technology for 160 kmph motorised bogies. Developing such bogies with fully suspended traction motors and under-slung propulsion system was a tough task. Our exteriors have often been singled out for criticism and we had to innovate, within our limitations, to present an attractive exterior. Then there was the task of coordination with various third party equipment to talk to each other digitally and our engineers had to work hard to make that possible. Suffice it to say that it has been a remarkable journey and I salute the team ICF and the associated industry partners for making this possible. There was tension, bitterness, and temporary disappointments all the way, but we have been able to deliver. I am not aware if a project of this magnitude has been completed, from concept to prototype, anywhere in the world in such a short time. I have worked on nearly all major rolling stock design and development programmes of Indian Railways, including major locomotive projects, but I can say without any doubt that this would count as the biggest challenge and the greatest success of our indigenous programme with complete ownership of technology with ICF. There are plans to manufacture train sets with sleeper coaches for travelling at a speed of 160 kmph, which will eventually replace the Rajdhani trains. There is a plan to manufacture full aluminium body coaches for train sets (code-named Train 20) for which ICF is awaiting advice from the Railway Board for floating tenders. Does Train 18 require a special signalling and track system to run above 180 kmph? Obviously, for a train to run at a speed higher than 160 kmph, a lot more safeguards have to be made, like fencing the track to avoid cattle being run over and other hindrances in the track, which may prove to be dangerous for the safety of train. The strength of track and signalling also have to be improved on which Indian Railways is already working. Is ICF facing issues like dearth of skilled staff and lack of enthusiasm amongst the employees? It is not true that ICF lacks skilled employees; at least I have not seen anything like this. On the contrary, I have always maintained that the staff had good capability and competence and added to that a sort of chutzpah to do something new. My job was to provide the leadership and channelise their energy. And to remove their doubts about our capability as a team to deliver what was hitherto unthinkable. As Lucio says in Shakespeare’s Measure for Measure: “Our doubts are traitors and make us lose the good we oft might win by fearing to attempt.” We attempted without fear of failure and we succeeded. ICF always boasts of highly skilled employees and I did my best to improve their standard of living through various measures like improving cleanliness, providing a pleasant working environment and better sporting facilities. From being a coach factory which earlier relied on foreign technology to becoming a manufacturing unit which is self-reliant and indigenous, what sort of changes have you seen in the working of ICF in recent years? ICF has come a long way since its inception in 1955. It has manufactured more than 58,000 coaches of a staggering 700 variants, a world record of rare distinction of having manufactured the highest number of carriages under one roof in the world. ICF keeps innovating and improving the quality, aesthetics and comfort level of public travelling in the coaches. More importantly, ICF is adopting a green approach so that coaches manufactured are environment-friendly. In fact, all our coaches are manufactured with green energy unlike other factories, as we are a unique carbon negative organisation. Where do you see ICF Chennai in two years? Train 18 is a game-changer in many ways and we would be manufacturing a large number of Train 18 and its clones. Other products that we would deliver by the end of two years should be standard gauge metro coaches and should be well on way to receiving the first aluminium-bodied train set and preparing its indigenous manufacture. Summing up, ICF should become a great train factory making 3,600 to 4,000 coaches by then with an improved quality and many variants. This year we are well on our way to make a 33 percent jump in production from an already world record level of 2,503 coaches in 2017-18. What measures have you taken to improve quality in terms of aesthetics and longevity of products? We go to the best sources for quality products for manufacturing of coaches. We periodically check the quality of products and weed out poor suppliers. The staff of vendors is also trained at the ICF. As an instance, the welders are qualified and certified by the Advanced Welding Training Centre of ICF. Fortunately, most of the inputs are available domestically and through Make in India efforts, we also consult global leaders to get the best parts for the coaches. The skill set of the employees is also upgraded duly keeping abreast of the latest technologies, which help in not only improving quality but also reducing costs. Will ICF turn its focus on manufacturing fast speed coaches or will it restrict itself to producing only LHB carriages? ICF has to cater to all class of travelling public and manufacturing EMU, MEMU and DEMU type of coaches is also its priority. ICF looks into the future where train sets will replace the conventional loco-hauled trains. Train 18 coaches as of now can run up to 220 kmph technically. It can be adopted for other designs of coaches also. However, infrastructure for operating such coaches at higher speeds needs to be in place. And as for high speed, we hope the technology provider chosen by the government collaborates with the ICF.